Millburn, NJ — In an effort to continue providing the safest, most effective procedures for his patients, Dr. Harold Pollack, a dentist in New Jersey, says he has incorporated an innovative digital x-ray that helps reduce radiation and improve the quality of his diagnostic treatment. As more and more patients have begun to seek dental treatment from conscious, conservative practices, Dr. Pollack says he is excited to meet the needs of patients at his practice by striving for the latest in high-quality care. As a family dentist in New Jersey, he says treating patients of all ages with safe, effective procedures is of the utmost importance, and he hopes the digital x-ray helps him achieve that goal. According to the Center for Disease Control and Prevention (CDC), over 78 percent of children ages 2 to 17 visited a dentist in the last year; however, 16 percent of American children have untreated decay. 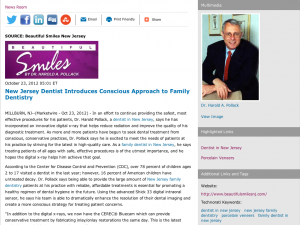 Dr. Pollack says being able to provide the large amount of New Jersey family dentistry patients at his practice with reliable, affordable treatments is essential for promoting a healthy regimen of dental hygiene in the future. Using the advanced Shick 33 digital intraoral sensor, he says his team is able to dramatically enhance the resolution of their dental imaging and create a more conscious strategy for treating patient concerns. Developed by Sirona, a dental technology company, the Shick 33 Digital Intraoral Sensor and Image Enhancement System is designed to offer dentists a state-of-the-art level of resolution and control. Dr. Pollack says improving the clarity and quality of the x-rays at his practice allows him the opportunity to provide patients with a better diagnosis and treatment plan. By implementing the new device, he says he is able to continue placing a major emphasis on the overall quality of his patients’ health and well-being. “With the latest in dental technology, we can provide our patients with less invasive dentistry,” says Dr. Pollack. Dr. Pollack says he is looking forward to introducing the digital x-ray to his practice and hopes it serves to inspire further pursuit of the most comprehensive treatments available for his patients. However, as with any dental procedure, he encourages patients to seek the consultation of an experienced and qualified dentist before undergoing any treatment, regardless of whether they are looking for a routine checkup or cosmetic porcelain veneers. Dr. Pollack adds that by selecting a practice dedicated to providing the most thorough, conscious approach possible, patients can be sure to achieve safe and effective results. A graduate of the Temple University School of Dentistry, Dr. Harold Pollack has devoted over 4,000 hours to his continued education and has achieved Fellowship with the Academy of General Dentistry. Additionally, he is a member of the American Academy of Cosmetic Dentistry, the American Dental Association, and several other professional organizations. Dr. Pollack has been selected as one of the Best Dentists in America, as well as a Top Dentist by NJ Monthly. Located at 280 Millburn Avenue in Millburn, NJ, Dr. Pollack’s practice can be reached at (973) 947-4331. He and his team can also be contacted online via the website beautifulsmilesnj.com or facebook.com/drharoldpollack.